Interview with Isaac Porter, M.D. In this episode, Isaac Porter, M.D., a solo practitioner in Raleigh, North Carolina is interviewed. Listen how he uses his website and video to successfully market himself. 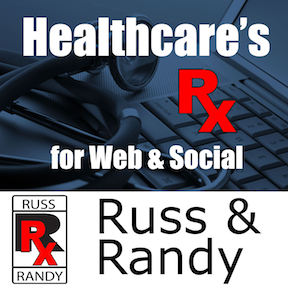 Learn his most effective digital tool in helping him get new patients. Isaac and I met several years ago as we share a common interest in Internet marketing and social media. This interview was recorded at the recent AAO meeting in October 2016. Well not actually in the room, but just outside our "quiet" office space we found in the McCormick Place in Chicago was a construction zone. The background noise is from a helicopter lifting generators to an adjacent roof top. While the background noise could not be digitally cleaned, he has some great "pearls" and insights on how he successfully implements YouTube and reviews to market his practice. Isaac is an ophthalmologist and cornea specialist. He is now in solo practice after having purchased his practice from his senior partner. Isaac describes his older partner as an "early adopter," having a website as early as the mid-1990s. Porter Ophthalmology has a website, video blogs and produces a written transcript from each video. To date, there are approximately 130 patient education videos on YouTube where various eye diseases are discussed. These videos have taken him about 4 years to produce. He produces the videos himself using a DSLR (Nikon D5000) in his office. Episodes are continuous and not edited. Videos are short, between 2-2.5 minutes each. His videos, a series called "A State of Sight," have attracted almost 600k views. It's important to notice that he does NOT pay a commercial vendor for video production. Porter Ophthalmology takes the team approach, all sharing in their digital marketing strategy. Though Dr. Porter takes the lead, it is quite clear that the entire "team," shares in their marketing effort - truly impressive. Isaac takes the lead by asking patients for reviews and the team follows up with emails including directions for both mobile and desktop. Each team member contributes to the effort of producing content. Listen how they do it!